Water - In both situations you need to drink lots of water. It was hot and humid in Atlanta. It's hot and humid in Orlando. My hotel was close enough to not be on the shuttle route but not close enough to get to the convention center without being drenched with sweat (sorry, that's gross). As you might imagine, the convention center has to be very large to accommodate so many attendees. You'll need water to stay hydrated inside and outside the convention center. 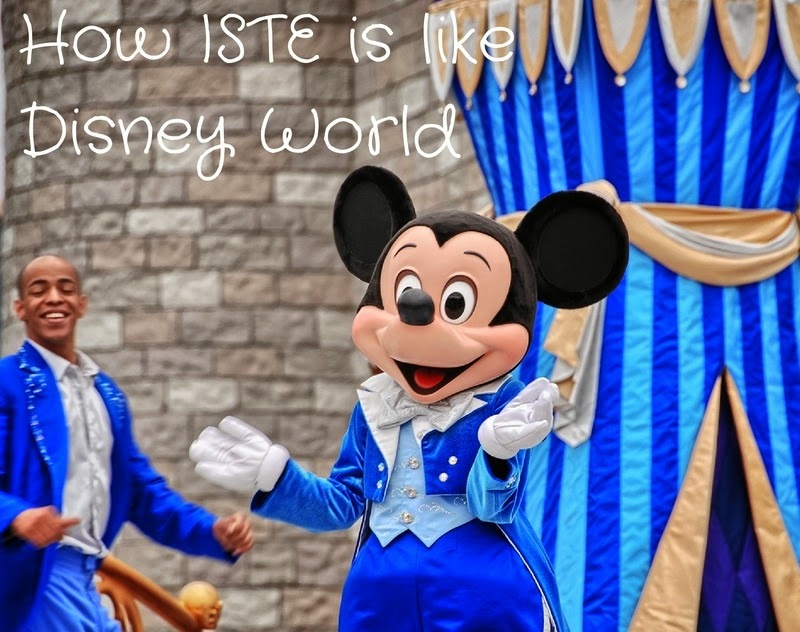 A Plan - To get the most out of both ISTE and Disney, you a plan. At ISTE decide which sessions you'd like to attend, figure out where they are and if you can get from one to another in enough time. Some sessions, like Ignite talks, have long lines take these into account when planning your schedule. It's helpful to have a back up session in mind as well. At Disney, map out what rides and attractions you want to see. Planning a Disney route will keep you from back tracking or walking too much. Friends - Everything is better with friends. At ISTE make sure to plan times to hang out with friends. The Blogger's Cafe is great for this. You can hang out in the Welcome Center to make new friends. Make specific plans to meet up with your PLN friends, otherwise you'll be on the plane home and realize you didn't get to meet some people face to face. At Disney, no one wants to ride alone. Characters - Both places have it's fair share of characters. At both places you'll find people chasing after these characters. You might think this is strange or it might be right up your alley. Either way do what works for you. Just remember, at ISTE everyone is a human being. Some are real and some are not so real. Sit and talk to them. See if you connect with them. Can you learn from them? Do they want to learn from you. Photos - Don't get so caught up in the fun and excitement that you forget to take pictures. Once you get home, you'll want something to look back on and remember the fun times. Spring was roller coaster of highs and lows. Ryan started a new job that he loves - high. I became ill - low. We bought a house in an awesome neighborhood full of the boys' friends - really high. I did not get a job that I had my heart set on - very, very low. I'm hesitant to write about the job. It was a job inside the district. I don't want to be seen as a complainer. I love the job I have and I know lots of people would love to have it. I love my district. I love the students and teachers I work with. That's part of why not getting the job has been so hard for me. I love the district, students and teachers so much and I wanted the opportunity to make a positive changes for them. To be honest, not getting that job really messed me up (I believe that's the technical term). The entire situation left me feeling rejected, disrespected and unvalued. It's been a while and I'm still raw. I'm about to cry thinking about it. I know in my head that God works everything together for his purpose and that he has a plan. But somehow my emotions and tear ducts have still not gotten the message. I've stopped talking to my friends about it because I just keep saying the same things. That's not me. I've been rejected plenty of times. And I'm great at making a plan, attacking that plan and moving forward. Not so this time. So, I did not arrive at ISTE in the best frame of mind. When I was thinking of how to describe my time at ISTE, I kept thinking "highs and lows". I spent a lot of time feeling anxious and out of place. I didn't know as many people as I thought I would. 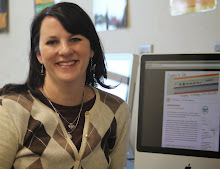 At TCEA, I could sit in the Blogger's Cafe and know all kinds of people. At ISTE, sitting in the Blogger's Cafe meant strange faces. Which should not have been a problem. I should have been able to introduce myself and have an intelligent conversion. I'm an intelligent person at a conference about my passion. But I could not shake the anxiety. I kept thinking, "I have nothing intelligent to say to anyone." I spent more time in my hotel room during ISTE than I would have normally. I did not want to be in large crowds. I was most comfortable walking with my close friends. Then the spotlight could be on them. I often joked and called myself a groupie last week. That's what I was comfortable doing. (For more on anxiety, please see Nicholas Provenzano's awesome post of the subject. The crowds, that's another thing. Everywhere I went there were crowds. Crowds to get on the escalator. Lines to get in the bathroom. After Ashley Judd's keynote, it took Rafranz and I 45 minutes to get out of that room. There was only 1 door out and 2 escalators up (the 3rd was busy coming down with no one on it). The conference center just did not seem to flow very well. During ISTE and immediately afterward, I would have told you that I wouldn't be traveling out of state to another ISTE. Now that I've had time to think about it, I understand how my state of mind and anxiety damped my trip. I realize that I was exhausted before I even arrived. During June I traveled to Austin for 3 days, worked at school for 4 days, moved, and road tripped with my family to Chicago. I had one full day at home between Chicago and Atlanta. And I spent that day unpacking, doing laundry and running errands so I could leave again. I may try it again. I wish I had spent some time in the exhibit hall. I wish I had made a better effort to connect with some members of my PLN. I will try again. I love to learn. I love to serve teachers. I love to meet other passionate educators. I can do all that ISTE. See you in Philly! Last week I was able to attend #ISTE14 in Atlanta. The conference is HUGE! 16,000 educators gathered together to learn more about utilizing technology in education. Here are some of my highlights and thoughts. Ignite sessions are 5 minute/20 slide sessions where 7-8 presenters get to share their passion with you. I was so proud that my friend Rafranz Davis spoke this year. Her talk is below. I also enjoyed Nicholas Provenzano's session. On Monday, I did a poster session. The topic was Tech Camp. Poster sessions are like a science fair. You set up your little booth and hope people stop by to visit. I did not know what to expect as this was my first ISTE. I was overwhelmed at the number of people who stopped by to talk to me. As well as my awesome PLN who all came by, listened and applauded. I spoke almost non-stop for my 2 hours. About 350 people took business cards. I was thrilled to share with so many people. Here's a collage I made of my booth, my PLN and some pictures Carrie and Rafranz took of me. I was thrilled to attend a session on SAMR from it's creator Ruben Puentedura. He connected SAMR and the TPACK framework. His slides are here.